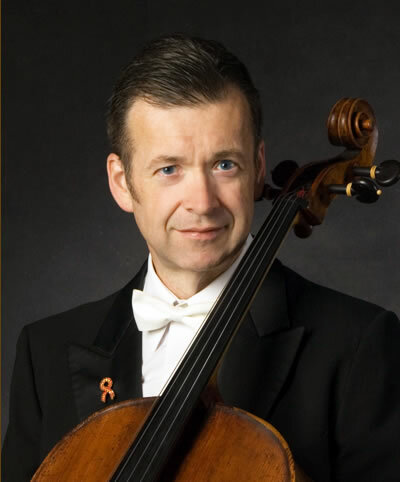 John Walz is a celebrated soloist and chamber music artist, known for his dazzling virtuosity and elegant musicianship. A student of the legendary French cellist, Pierre Fournier, he has appeared as soloist with more than 150 symphony orchestras on 4 continents. His performances of 25 different concertos include both standard showcases and rarities like Martinu’s Concerto #1 and William Schuman’s Song of Orfeus. In 1979, Mr. Walz, along with pianist Edith Orloff, founded the Pacific Trio. Now performing with violinist Roger Wilkie, this renowned ensemble has played more than 900 concerts throughout North America and Europe. His ever expanding discography includes recordings of the concertos by Dvorak, Haydn, Shostakovich, Bloch, Martinu, Vivaldi, and trios by Brahms, Dvorak, Smetana, and the newly released Pacific Trio CD featuring Beethoven’s Triple Concerto and Archduke Trio. Visit the Pacific Trio website.